Featuring more than 20 acclaimed, award winning shorts plus two never-seen-before animations, PLYMPTOONS compiles the best and brightest work of the Academy Award ®-nominated animator Bill Plympton, master of the animated black comedy world. During the career spanning over 30 years, Plympton’s creativity and talent have earned him countless accolades and a worldwide cult following. This uproariously funny collection brings together the very best of his early work including commercials, animated spots, and short film. A journey through this political-cartoonist-turned-animator’s canvas of animation, PLYMPTOONS offers up a delicious does of mutated humor, from Plympton’s first college-era film, “Self Portrait” to the Academyt Award®-nominated “Your Face”, his first solo effort. 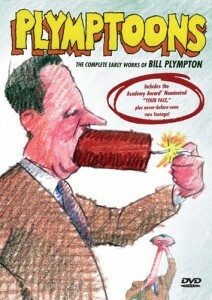 SPECIAL DVD Features: Two exclusive Bill Plympton Documentaries, Sketch gallery, Animator Biography, Interactive Menus.